Oasis – it’s a word that conjures up a haven of palms and endless sands, or at least shade and a pool in a parched landscape. 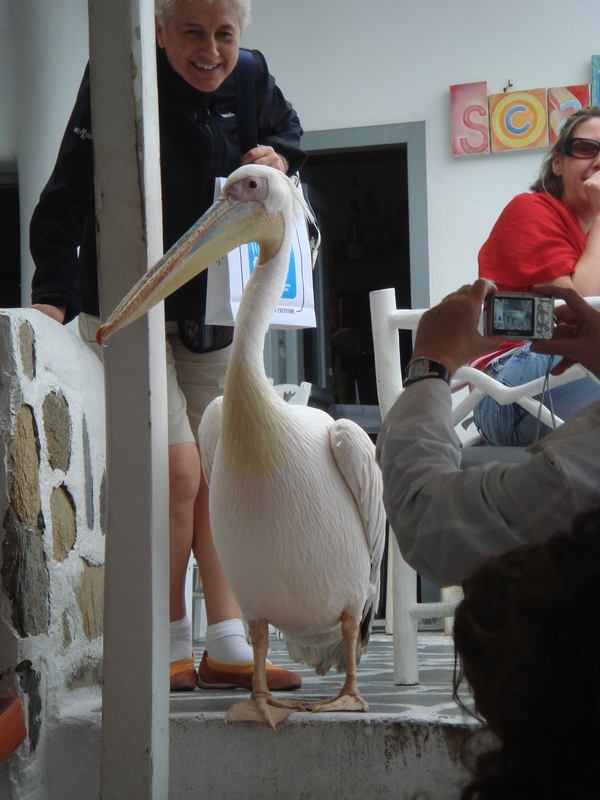 The Oasis Garden Restaurant in Mykonos has neither palms nor ponds. But, tucked into the corner of a square overhung with bougainvillea and surrounded by neat blue and white houses, the Oasis Garden with its flowered, sheltered courtyard, is a haven of hospitality. It’s at Oasis Garden that we spend our last evening on Mykonos. It’s a quiet Sunday night and until a quartet of young Brits drops in for a night cap, we’re the only customers. So the entire place is ours. We are at home, or at least at the home of old friends or neighbours. The meal is beautiful – from the tazsiki, taramasalata and Greek bread at the beginning, to the baklava at the end. The service is impeccable, the setting exquisite and the ambience wonderful. It’s a perfect last supper. Our Sunday afternoon drive around Mykonos begins and ends with beaches. With our Guide Spiros at the wheel of Windmills Tours’ unprepossessing little Econovan, we head out of Chora, past beautiful Mikhaliamos, the place of sand, then up over the hill. On the other side is Korfos Bay, where a tier of new houses is under construction. Since 1977, to preserve the integrity of the environment, the law on Mykonos has limited architecture to the Cycladic style. These Korfos houses are laid out along the hillside, like illustrations of each stage of the art. Some are just concrete shells, others have their coats of white plaster and others have their shutters in regulation colours of mauve, blue, turquoise or red. 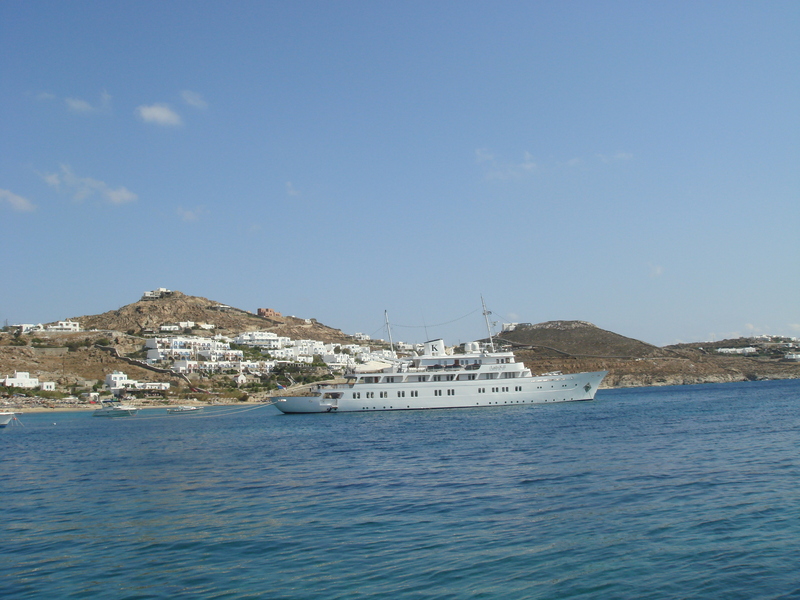 From Korfos we look across the bay to the island of Delos, Sanctuary of the gods, and to Saint John’s Beach, where the seminal feminist movie, Shirley Valentine, was filmed. 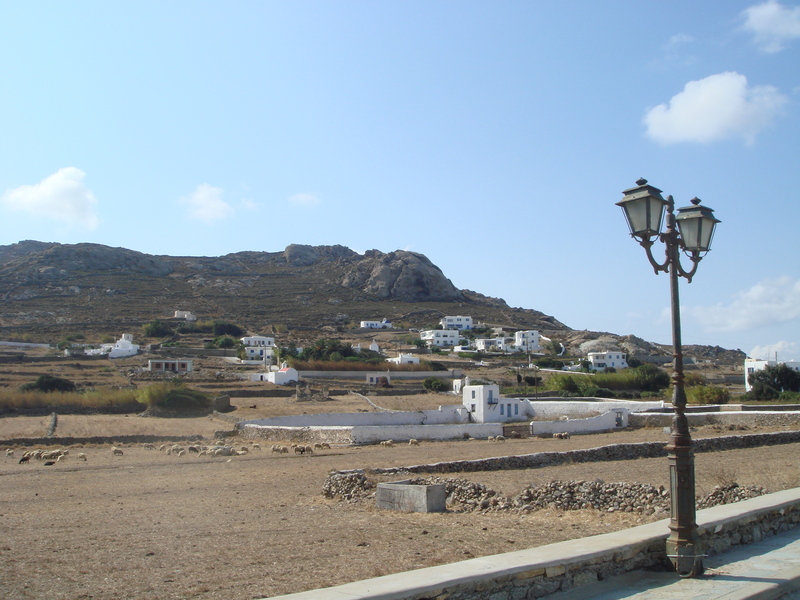 Driving across the island from Korfos, on a narrow road bordered by stone walls, we pass fields where a few scraggy sheep pick at sparse blades of grass. Once, Spiros tells us, these fields grew abundant crops of wheat and barley for export to Russia. Houses, like trees and foliage, are scattered. Some are crumbling into piles of rubble, others are freshly white-washed. We pass a huge cactus with fruit that look like an alien life-form. The road takes us to Ano Mera, a village drawn in around a square, where a child’s bicycle lies abandoned, its wheels spinning idly, while handful of tourists and locals laze in the afternoon sun on a café terrace. On the other side of the square is Panagia Tourliani. This 17th century monastery has an impressive bell tower with elaborate stone carving. 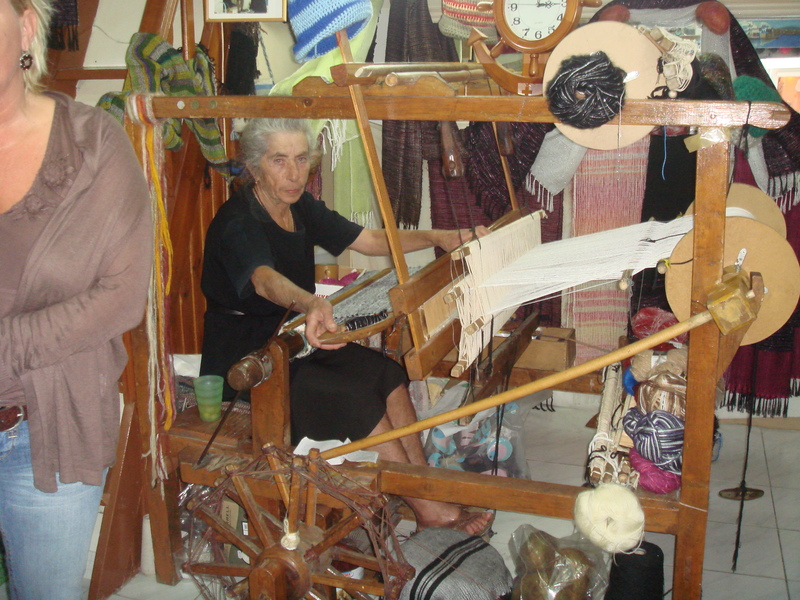 It is also home to two museums, the Ecclesiastical Museum, were the precious Epitaphos of Eleni of Mykonos Town is kept and the Agricultural Museum, which has a wonderful collection of farm implements. The monastery church is regarded as the protectress of Mykonos and every year on August 15th, one of the island’s most important festivals is celebrated here. The church houses numerous beautiful pieces of folk art but its pièce de résistance is the stunning wooden iconostasis which was carved in Florence in 1175. After a visit to the church of Panagia Tourliani, we suggest a spell in the sun on the café terrace, but Spiros knows a better place. We head down the cliffs into a semi-circular bay that is fast filling with Cycladic houses on the grand scale. On the beach thatched shelters are lined up. A life guard’s tower rises above them. This is Paradise Beach, place of endless summer parties. It’s almost deserted now. 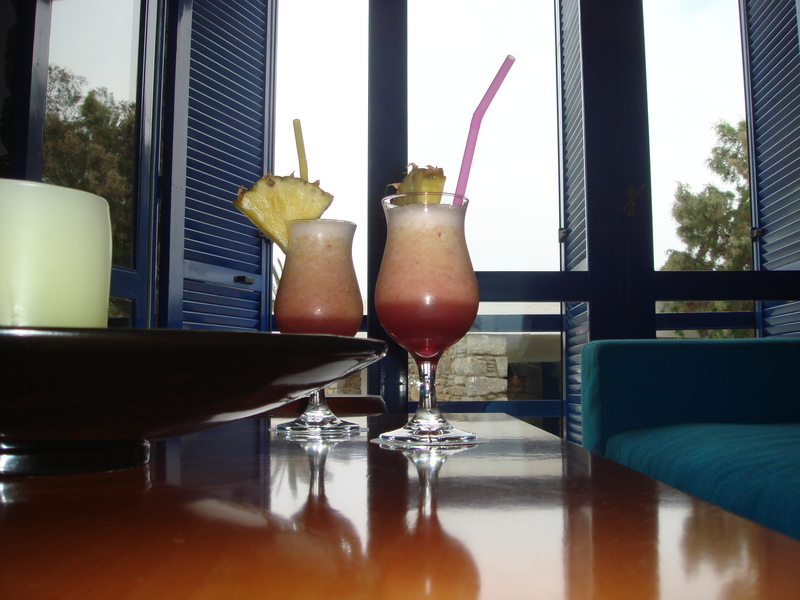 In contrast, the nearby beach bar is busy – it’s the hour for apératifs and Mezes. We find ourselves a corner table. Over Mythos and Mezes, we find our common ground. Spiros shares his dreams of an eco tourist resort, of a business introducing the finest Greek produce to the world – Symposio. We watch the sun sink lower in the sky. Our last stop on the tour is at Psarou Beach- the playground of the rich and famous. There is a yacht anchored just offshore. The beach is empty this late in the afternoon but the churned up sand attests to a busy day. Men at Work’s “Land Down Under” booms from the nearby bar. It’s happy hour. But somehow the song strikes a harsh discordant note here. It bounces off the cliffs and echoes too loudly around the sheltered bay. It cuts across the gentle swish of the waves and the distant hum of a boat. 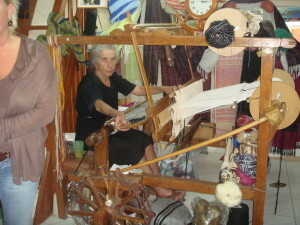 For us it’s a time for silence or perhaps for some poignant Greek music. It’s time to head back to Chora. It’s been an amazing afternoon with an erudite, eloquent and inspiring guide. 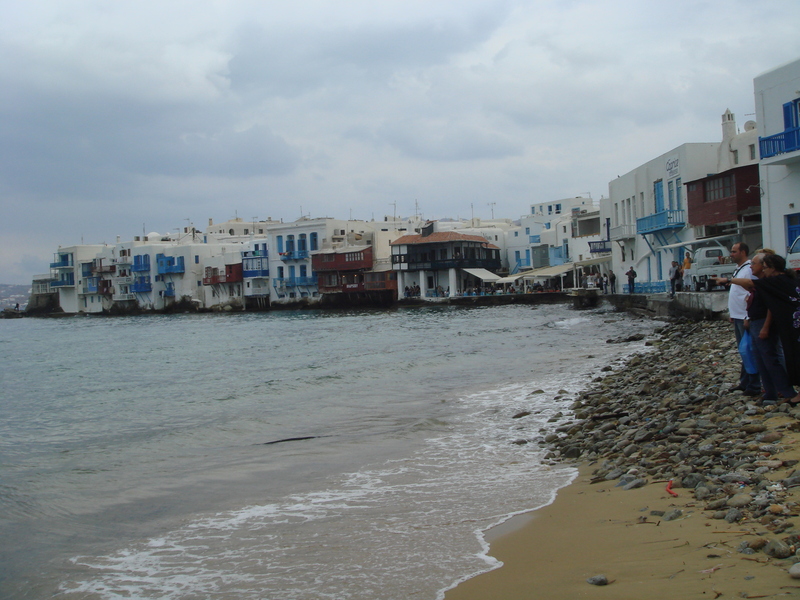 The September Saturday night on Mykonos is wet and cold. Seaside bars, restaurant terraces and nightclubs have no appeal, even on the most famous party island in Greece. The soft, warm light of Theoxenia’s bar and restaurant are seductive. We opt for a night in. Sipping on a pre-dinner Mythos in Theoxenia’s lobby bar we watch more intrepid fellow guests set off for their Mykonos Saturday night out. A pair of vampires flits past, followed by Derby and Joan in Macs and Wellies. I catch the barman’s eye. He smiles and shakes his head. “You can’t possibly imagine …” he begins. But before he can complete his observation, he is called away by a customer. To bring him back to the subject five minutes later would seem nosy, if not rude, so I am left imagining what I couldn’t possibly imagine until dinner time. 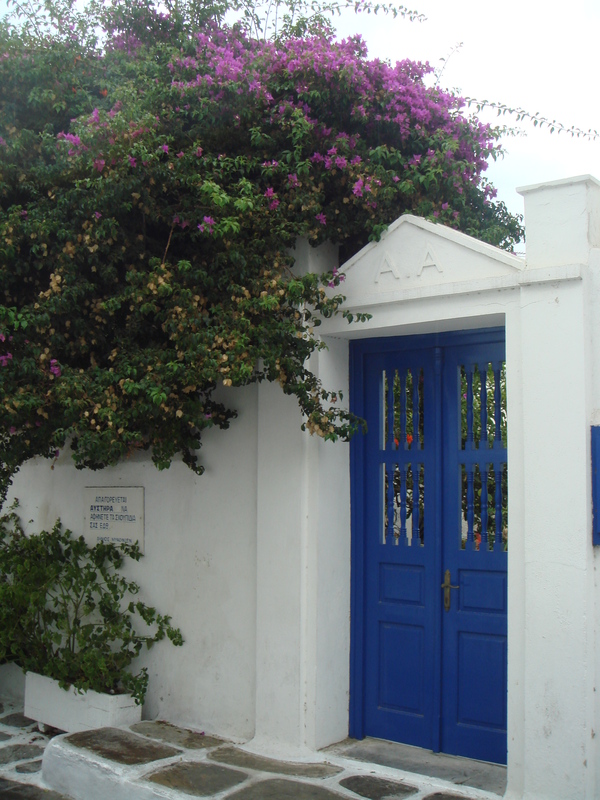 Theoxenia’s restaurant continues the simple, understated stone, white and blue of its Cycladic exterior. A large wall of windows looks out over the sea. With the darkness of the autumn night behind them, they reflect the warm glow of the room. Travelstripe is not a gourmet and you will rarely find effusive raves about food in these posts. But the cuisine at Theoxenia must not go unmentioned. Our meal began with a taste of a sort of frittata, courtesy of the kitchen – delicious! Next we shared Haloumi parcels, with olive tepanade and balsamic dressing on a bed of rocket and sundried tomato salad – even more delicious. This was followed by chicken breast stuffed with haloumi and sundried tomatoes served with baked aubergine (for him) and fresh salmon on steamed spinach and redoman with balsamic vinegar (for me) – more delicious still. Unfortunately, we were unable to even contemplate desserts after this marathon. We returned to Theoxenia’s restaurant quite early the next morning. Outside that wall of windows the sky was blue and the sun was dancing on the sea. The air was heavy with the aroma of Greek coffee. There were full cooked breakfasts of several nationalities on offer but why would you, in fact how could you, when the buffet offered Greek yoghurt, honey, figs, bread, pastries and all kinds of local treats? Mykonos is certainly one of, if not the most beautiful of the Greek islands. It is known as the jewel of the Aegean and no wonder! Everything here is in complete harmony, both the works of nature and the works of man. Everything is to perfect scale. Nowhere is this balance more beautifully illustrated than in Mykonos town. It is threatening rain – not an afternoon for the beach – so I turn up a narrow cobbled laneway away from the sea. Small white houses, with blue shutters and gates, crowd in around me. Mykonos Summertime, the island’s premiere lifestyle and travel magazine describes the island’s buildings as, “humble architecture, built at man’s height by free people who do not crawl to meet their master but who dare to look their God in the eyes” It is an apt description. Even monumental buildings, like churches are tiny, with a modest, understated, solid beauty. My laneway leads me to Akti Kambani, the main waterfront. At one end of the bay is a little church where seafarers give thanks for a safe return. On the waves beyond it, a flotilla of caiiques bobs idly at anchor. In more clement weather, the bay would be empty and all boats would be away, ferrying sun-lovers to the outlying beaches. Now, one small, sad-looking group of beach boys is huddled under a flapping umbrella outside a café, with their hoodies pulled up and their tans turning blue. Further along the waterfront I find Mando Square, named after Mando Mavrogenous, Mykonos’ most famous heroine who distinguished herself in the fight to overthrow the Turks in the 15th century. A statue to her memory stands in the centre of the square. The bay ends in a cluster of nightclubs. It is three in the afternoon, not yet party time, but even so, their closed doors have a look of finality. I turn away, into another lane. Two storeyed shops crowd in on either side. In one, a rack of hoodies catches my eye. I have to have one. The lane is cold and like the boys down near the bay, I’m turning blue. 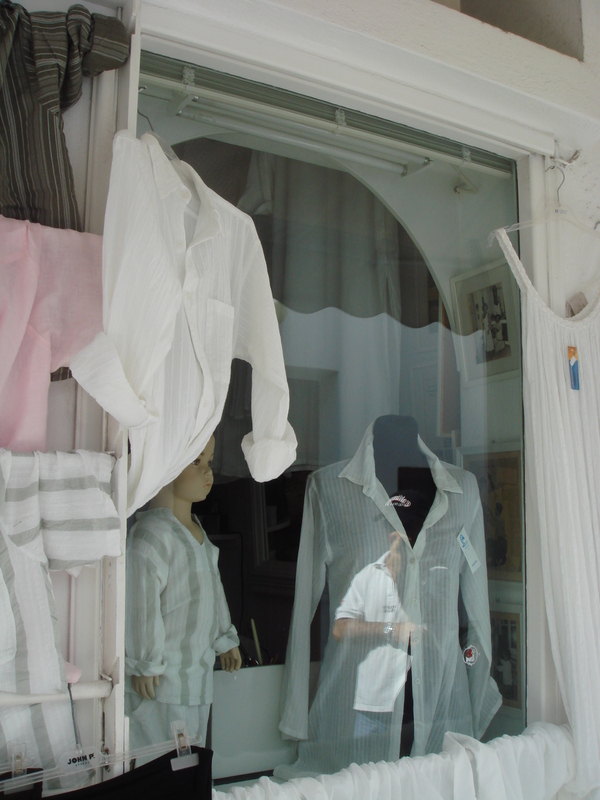 I pick out a pale pink number with the symbolic Mykonos anchor embroidered on the chest. As the lady in the shop helps me into it she tells me that the business was her childhood home, until the sixties brought the first tourists. Then, like many other householders in the street, her parents turned the ground floor into a shop and moved the family upstairs. She lives there still with her own family. Luxuriating in the fluffy warmth of my new pink hoodie, I follow the rise of the lane up the hill. I pass walls, hung with bougainvillea, threaded with pomegranates and apples. 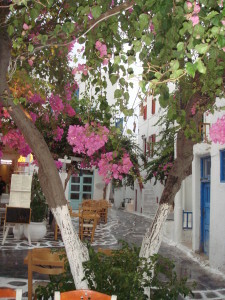 The lane opens into a square hung with canopy of grapes and bougainvillea. 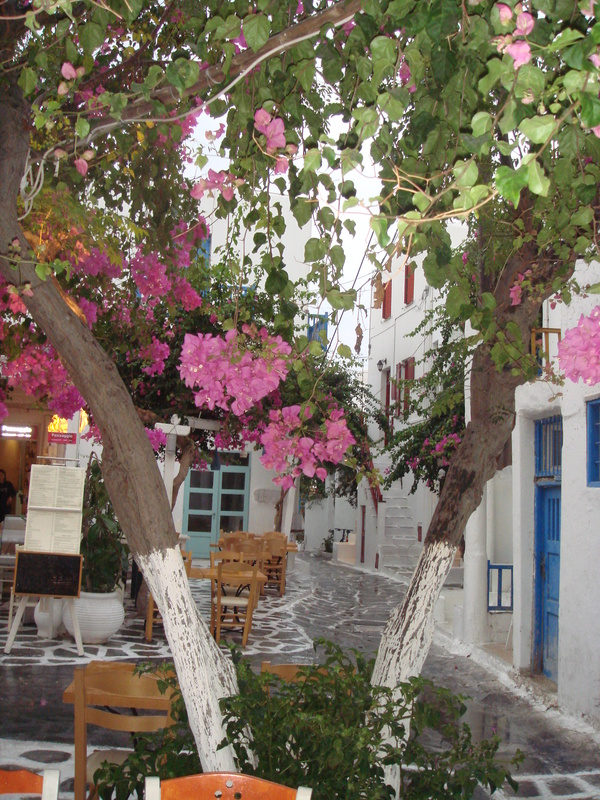 It is the perfect place to stop and just ponder this place called Mykonos. 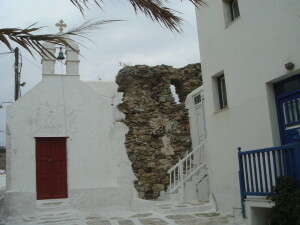 In 1390, Mykonos became a dependency of the Venetian Republic. During the 21 years that it remained part of Venice, the island enjoyed great prosperity. Wealthy Venetian merchants set up their businesses and built their houses, as they had on their native soil, close to at the edge of, and even over the water. 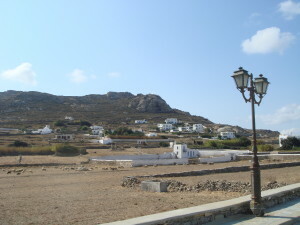 The area where they settled still survives today as Venere or little Venice, on the western coast of Mykonos. Packed with cafes, restaurants, bars and brightly coloured Venetian loggias, it is one of the island’s most touristic areas. Its night life is legendary and it is the best place on Mykonos to watch the sun go down. Venere leans so low over the sea that from my table at the Sunset Café, I could almost dangle my hand in the water. It was a rather windswept, somewhat damp lunch, with considerable vigilance and both elbows needed to anchor the table wear, but it was well worth it for the views of both land and sea as well as the incredible parade of people passing by.